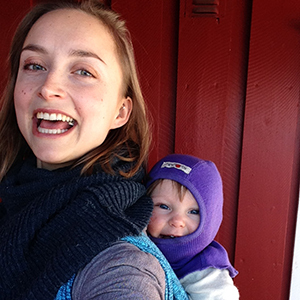 Jeg heter Annie, og jeg ble mor til ei jente i april 2016, som jeg har babypottet siden hun var 4 måneder. Ja, jeg skriver babypottet - for eliminasjon kommunikasjon er et så langt og vanskelig ord. Men det betyr det samme; å tilby barn et annet sted enn bleia å bæsje og tisse i, så tidlig som fra fødselen av. Oversikt over kommende kurs finner du på Ticketco. Jeg holder også privat veiledning og kurs for privatpersoner eller grupper, for eksempel bareselgrupper. Ta kontakt om du er interessert! I read about it online, I i thought it sounded far too alternative for me to consider. But a couple of months after my first child was born, i got keen on trying. I just tried holding her over the sink like i had seen on pictures, and she peed a lot first time i tried. I was amazed! Now I have become passionatly interested in pee and poo and how we treat the hygiene of our little ones. Its became existential for me, and its a great gift for me every time i get to teach a new parent about this beautiful, but forgotten piece of childrearing. I think the implications of accepting that children actually asks for help when they need to go already from birth stretches way beyond just the actual action of getting the pee in the potty. The simple task of using the potty teaches so much more - listening, compassion and understandig between child and adult. My potette plus portable potty! The Continuum Concept. A totally gamechanging read.